Spring comes with all its beauties. 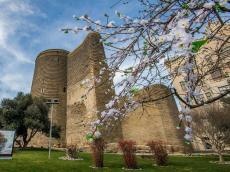 Rainless weather is forecast for the last day of winter in Baku and Absheron Peninsula. The weather will be foggy in some places, the Ministry of Ecology and Natural Resources reported. Mild north wind will blow in the afternoon. The temperature will be +2-5?C at night, +8-13?C in daytime in Absheron peninsula, +3-5?C at night, +10-12?C in the second half of a day. Air pressure records 770. Relative humidity will be 65-75% at night, 50-60% in the afternoon. In the regions of Azerbaijan, the weather will be mainly dry. It will be foggy in some places at night and in the morning. Mild east wind will blow. The temperature will be 0-5?C at night, +13-18?C in daytime, -3+2?C in mountains at night, +5-10?C in daytime.